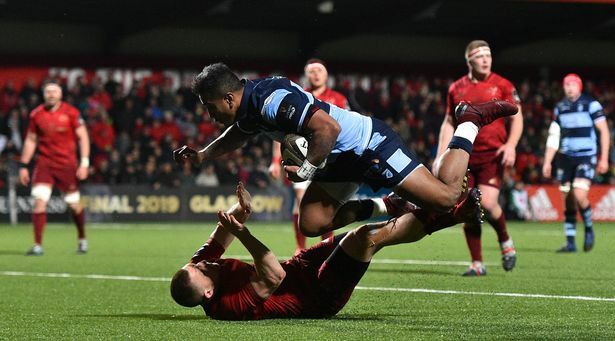 Cardiff Blues fell to a heavy defeat at the hands of Munster at Irish Independent Park on Friday night, leaving John Mulvihill's men on the back foot in the race for third in the Guinness Pro14's Conference A. With Connacht beating Zebre on Saturday evening, it means we have to go to Galway and come back with a strong win next week, and bounce back from what was ultimately a disappointing performance in Cork. Mulvihill had been forced into three injury changes initially for the game, with Josh Navidi ruled out for the season while Dmitri Arhip and Nick Williams picked up minor knocks, with Shane Lewis-Hughes, Dillon Lewis and Seb Davies stepping up to start. However there was a blow just before kick-off as Jarrod Evans was ruled out with an injury sustained in the warm-up, so Gareth Anscombe moved up to fly-half, Matthew Morgan started at full-back and Harri Millard came on to the wing. Fortunately for the Cardiff Blues it did not stunt our ability to hit teams on first phase attacks, as we went ahead with just six minutes on the clock thanks to a finely executed set play. Kris Dacey took the ball at first receiver allowing Anscombe to slide wider and finding Rey Lee-Lo running a superb line from outside centre to cut through the Munster defence. Tomos Williams tracked well on the inside but still had a lot to do, beating three defenders before touching down under pressure. Anscombe converted but Munster were sparked into life as they dominated the next 10 minutes, getting on the board with a Tyler Bleyendaal penalty after Seb Davies was penalised for a no arms tackle. The home side kept coming back, and although Cardiff Blues forced a knock on, the resulting defensive scrum was not effectively dealt with. Peter O'Mahony got away with a clearly illegal turnover and a few phases later Chris Farrell was over the line. Bleyendaal's conversion put the hosts ahead. Munster kept up the pressure culminating at the 30 minute mark when Jean Kleyn drove over from close range after a well worked lineout, and with the conversion we were staring at 17-7 deficit to go with a malfunctioning set piece and less than effective kicking game. Not prepared to let the game slip out of sight in the first half though, Cardiff Blues fought their way back into proceedings and worked a breakthrough within a few minutes of the half-time interval. Although the lineout wasn't taken cleanly, Owen Lane carried hard for a solid base to build off and Anscombe called the play perfectly, sliding around Lee-Lo to put Matthew Morgan into space on the outside before Aled Summerhill sprinted down the wing, dummying his way brilliantly past the last defender to score. Anscombe converted again to cut the scoreline to just 17-14 at half-time, despite Cardiff Blues having actually had very little of the play. The start of the second half was a different story though, with the away side winning a penalty straight from kick-off and embarking in a multi-phase attacking set down the field that eventually culminated in another penalty. Captain Kris Dacey opted to kick at goal, perhaps incorrectly, but it worked as Anscombe missed the penalty before a charged down clearance allowed us to re-gather possession in the Munster half. Anscombe made a smart half-break from a pull-back pass but was stopped by a high tackle, with referee Marius Mitrea awarding the penalty. Tomos Williams opted to take it quickly and danced through the defence brilliantly before having the awareness to offload for Rey Lee-Lo to score. The conversion pushed us slightly further ahead, but it didn't last as Aled Summerhill was pinged for not rolling away and Munster kicked straight to the corner, going through the phases before a Cardiff Blues defensive lapse allowed CJ Stander an easy run-in. Three multi-phase attacking sets came and went for the away side, with no joy coming from them, before Munster started taking us to the cleaners with the help of their strength on the bench. First Conor Murray got on the scoresheet somewhat controversially as he scored from the back of a ruck after the ball had already been held up over the line in the previous carry. Then Andrew Conway crashed over in the corner after Cardiff Blues had been counter rucked when setting up an exit, before JJ Hanrahan was allowed to slice through the defence far too easily and send Sam Arnold over in the other corner with a few minutes to go. The away side did manage to launch one more dangerous attack with just under 10 minutes to go, putting together a strong driving maul while Ethan Lewis broke towards the try line, but neither resulted in the all-important first try. In the end the scoreline probably slightly flattered Munster, but they were good value for their win, flexing their strength in depth with the likes of Niall Scannell, Tadhg Beirne, CJ Stander and Alby Mathewson on the bench. Cardiff Blues missed a great opportunity to secure a try bonus point in defeat, a point that would have put us in a better position ahead of next weekend's game against Connacht, but that has to be put away now. It's a huge week now for John Mulvihill's men to define the season, show off the team culture that has bound us over the last 18 months, and prove the quality that undoubtedly deserves Heineken Champions Cup rugby next year.